Until today it has been quite a few years since I last visited Peppa Pig World. I used to love visiting with Abby when she was smaller, but obviously as she has gotten older, our theme park days have changed and we haven’t found a reason to go back to Peppa Pig World. Today I was lucky enough to go back to Peppa Pig World with my older daughter and her son to experience a great day out without the crowds. There were so many memories as we walked into Paultons Park, and I couldn’t wait to go on all the rides old and new. 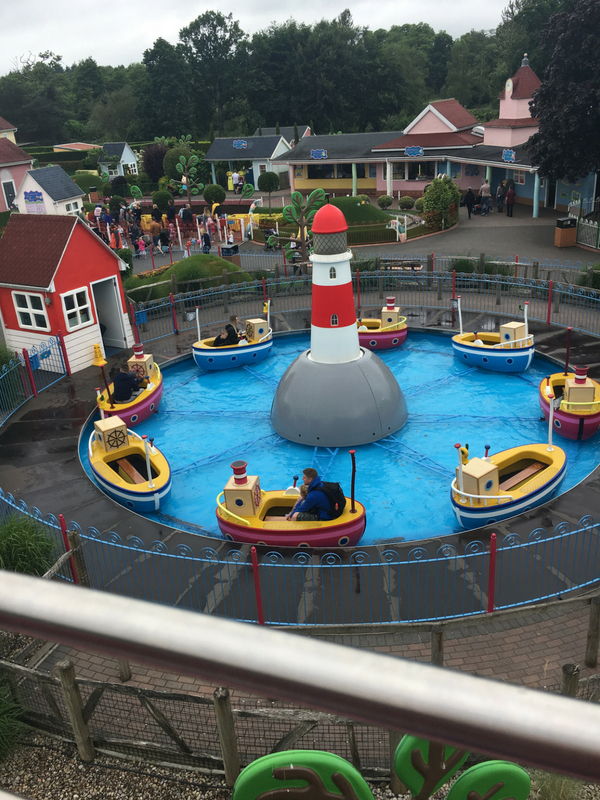 There are nine Peppa Pig World rides that are themed around the popular show. The latest two rides have only recently been introduced this year. 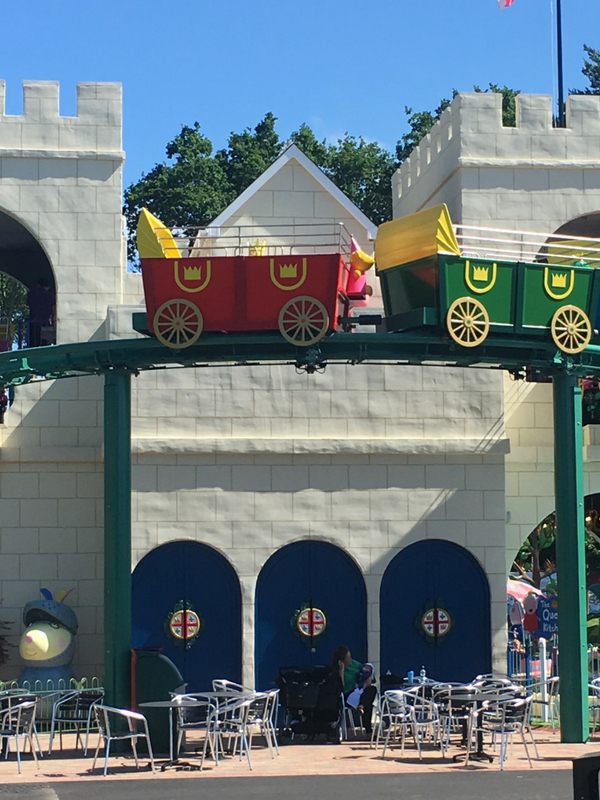 The Queen’s Flying Coach ride at Peppa Pig World is one of the newest rides for 2018. It’s a monorail ride that is suitable for everyone. Each themed carriage will seat four adults and two children. We assumed this would be a popular ride and made it our first stop of the day. I think it would be a lot busier on a weekend and in school holidays but today the queues didn’t go past ten minutes which was perfect for a toddler. Grampy Rabbit’s Sailing Club is the other new attraction in Peppa Pig World for this year. It’s located in the same spot as the Queen’s Flying Coach ride, and I think it space has been maximised really well. Each boat seats up to four people and there are no height restrictions which is great. Grampy Rabbit’s Sailing Club takes you on a gentle boat ride that spins as it floats along the stream. The last time we visited George’s Dinosaur Adventure, I remember the queues being really long. When we were nearing the front of the queue Abby needed to visit the bathroom and we had to leave the queue. It was so frustrating and we have never managed to experience this ride. Today I was determined to ride George’s Dinosaur Adventure, and I was happy that we each met the 85cm height restriction. 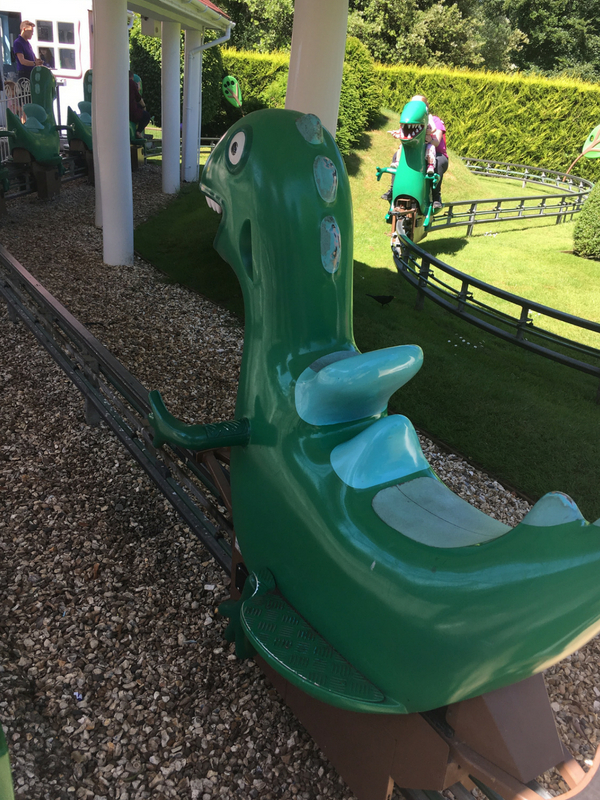 It’s a gentle ride where you sit on the back of a dinosaur and tour the track. 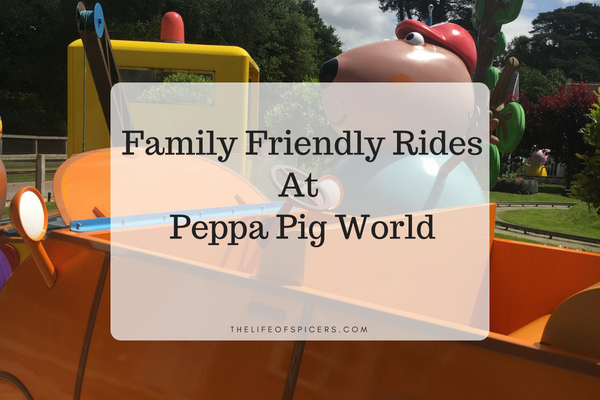 I love Daddy Pig’s Car ride and it brought back great memories of past visits to Peppa Pig World today. We probably queued here for the longest which goes to show the popularity of the ride, but even then we didn’t queue for long. Grandpa Pig’s Boat Trip is a fun short boat ride in a circle. The boats sit up to three guests if you are with two adults, so a family of four would find it more comfortable in two boats. I have great pictures from when Abby was small enjoying this ride, so will definitely be comparing from pictures from this visit too. 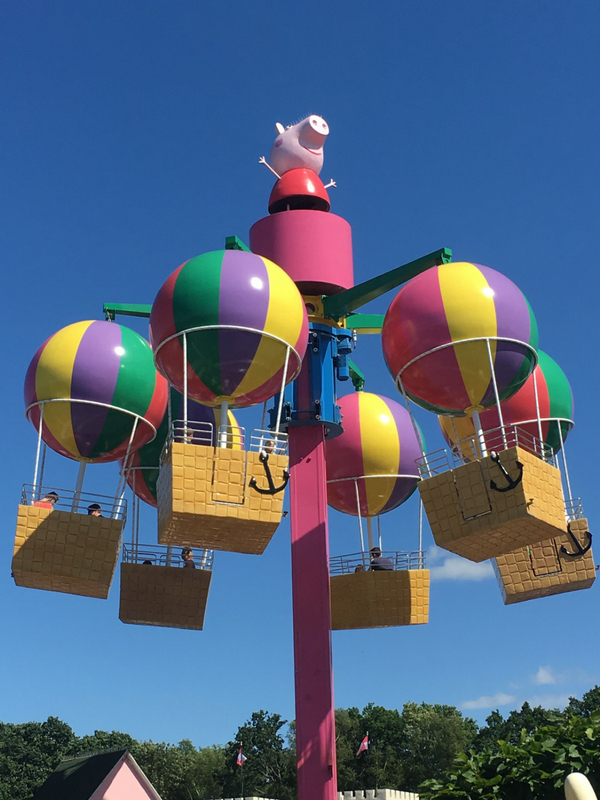 Think of the tea cups in the air and you are half way to enjoying Peppa’s Big Balloon ride. You side in an oversized balloon basket and are raised into the air before spinning around gently. This is a great fun ride, and I remember queueing for it for ages on past visits. Today the queues were a lot lighter thankfully. 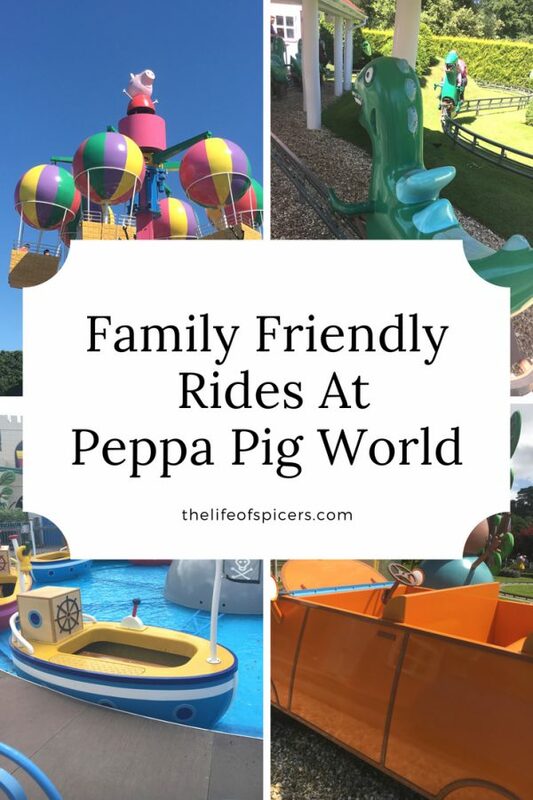 It’s a great way to see the sights of Peppa Pig World around you. Peppa Pig World Windy Castle ride takes you up into the clouds and spins you gently in the air. It looks quite high from the ground but it’s not too high in reality. I think on a windy day this ride could be quite turbulent as the carriages rock without any wind at the best of times. As you can see there are plenty of Peppa Pig World rides to keep the whole family entertained. As a grown adult I really enjoyed all of them. 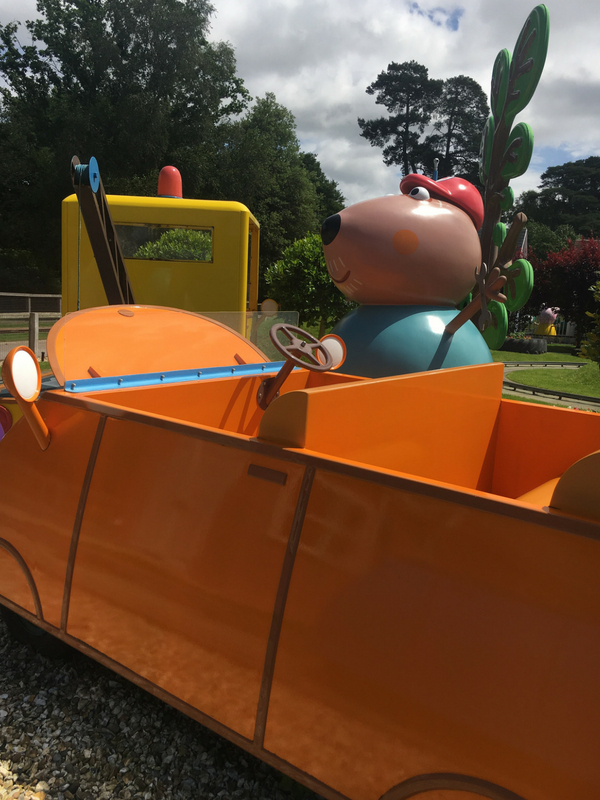 All of the rides in Peppa Pig World are suitable for children under 1 meter which is a great advantage to those ticket prices when children under 1 meter are free to Paultons Park.